The Vault is self-serve. Everything is priced by hand, there are no price scanners. Just keep track of your purchases and pay before you leave the counter area. There is credit card reader and a deposit slot for checks and cash. The Vault serves coffee via a commercial brewer and a Keurig K-cup brewer. Several syrups and creamers are available to punch up your java. Other beverages at the Vault are soda pop, hot cocoa K-Cups, apple cider K-Cups, various kinds of tea, sparkling water and bottled water. The Vault serves Blue Bunny ice cream treats and a variety of prepackaged snacks. 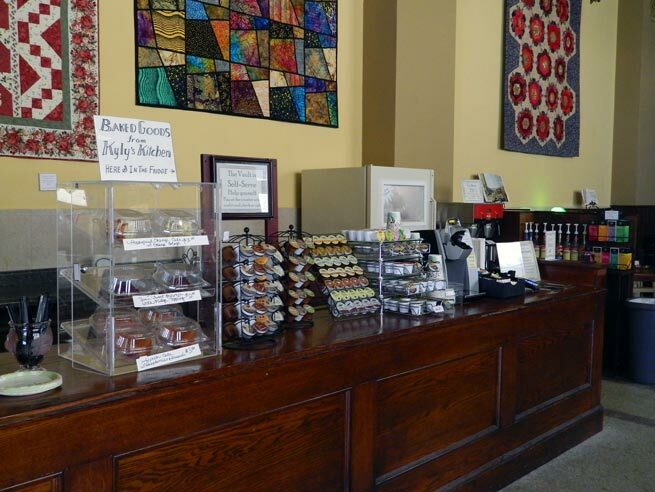 The Vault offers a constantly changing variety of unique baked goods supplied by our resident bakers. Menu items include creative cakes, frosted brownies, unique bars, and breakfast wraps. Every day is a new selection.